Hidden beneath the red sand country east of Shark Bay, the crater has been estimated to be 120 km in diameter and the extraterrestrial body that caused it was probably 5 km in diameter. This crater is fourth largest in the world - only the Vredefort crater in South Africa (diameter = 300 km), the Sudbury crater in Canada (250 km), and the Chicxulub crater in the Gulf of Mexico (> 180 km) are larger. An impact of this size is probably related to a significant extinction in the fossil record, similar to Chicxulub, which has been linked to the extinction of the dinosaurs at the end of the Cretaceous period, 65 million years ago. The Woodleigh crater, however, lies buried below more than 100 m of Cretaceous and Jurassic ( 100-200 million years old) sedimentary rock, and so predates that event. 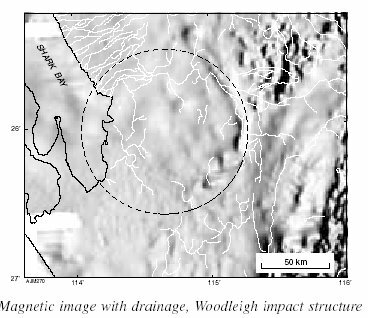 Geophysical data, and to a lesser extent surface drainage, were used to detect the crater, and to estimate its size. The cen- tral part of the crater, where the force of the impact caused the rock to "rebound" to form a dome of highly fractured rock, is about 20 km in diameter. This process is similar to the central peak that forms when a pebble is dropped into a pond. Exploration for coal in the area first detected the central uplifted part of the buried crater in the late 1970s. 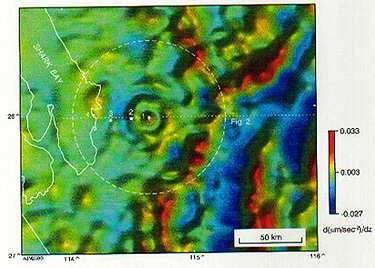 The signifi- cance of the circular feature was realised only in mid-1997 dur- ing an investigation of the Gascoyne region by GSWA geoscien- tists. They identified the unusual deformation of the quartz minerals as diagnostic of severe shock that developed under the extreme pressures caused by extraterrestrial impacts. These pressures (about 100,000 times greater than atmospheric pres- sure at sea level) are typically 10-100 times greater than those generated from earthquake or volcanic activity. As none of the samples from the 1981 drill-hole remain, the GSWA deepened the original hole in March 1999 to obtain core samples to confirm the postulated impact origin. The core shows extremely well preserved shock metamorphic features including thin veins of melted glass, breccia, and shocked quartz, thereby indisputably proving an impact origin. The youngest possible age for the impact is about 200 million years ago in the Lower Jurassic, based on the age of the crater in- fill sediments. The oldest possible age for the impact is con- strained by isotopic analysis of samples from the crater floor, which indicate a Late Devonian age (about 364 million years ago). "The size of the crater alone indicates that it would have had dramatic effects on a local and global scale," said Rob Iasky, Senior Geophysicist. "Locally, the impact could have triggered earthquakes and/or volcanic activity. Global environmental effects would have been catastrophic as such large impacts throw a huge amount of dust into the atmosphere. The resulting lack of sunlight, temporary changes in climate, and associated acidification of rain may cause the extinction of many species in a manner similar to a prolonged nuclear or volcanic "winter":"
A determination of the age of the Woodleigh impact ? now the world's 4th largest - was attempted using several isotopic methods. A pre-Jurassic age is indicated by overlying Early Jurassic sediments of the Woodleigh Formation, restricted to the ring synclines as well as onlapping the margins of the central uplift. The youngest deformed sediments include lower Devonian units, setting an older age limit to the impact. The isotopic systems of biotite in the basement uplift remained stable in the samples analysed, as shown by (1) a model Rb-Sr age of 835 Ma, and (2) K-Ar isotopic age of ~800 Ma, with marginal rim resetting to about 700 Ma. However, isotopic K-Ar analysis of illite and interleaved illite/smectite grains separated from granitoid of the central uplift and from basal diamictite of the inner ring syncline suggest upper Devonian ages. Thus, core sample W149148 yielded an age of 362 Ma, and K-Ar ages of illite and smectite separated from the basal diamictite at Woodleigh 2A yield late to end-Devonian ages. Infra-red laser spot fusion analysis indicates loss of potassium in pseudotachylite veins in shocked granitoid, and altered K-feldspar yielded ages mostly in the range 180-130 Ma, reflecting post-impact burial. The diamictite contains shale clasts containing early Permian palynomorphs, probably representing sedimentary mixing in the ring syncline. It follows that the Woodleigh impact structure is of late to end-Devonian age. 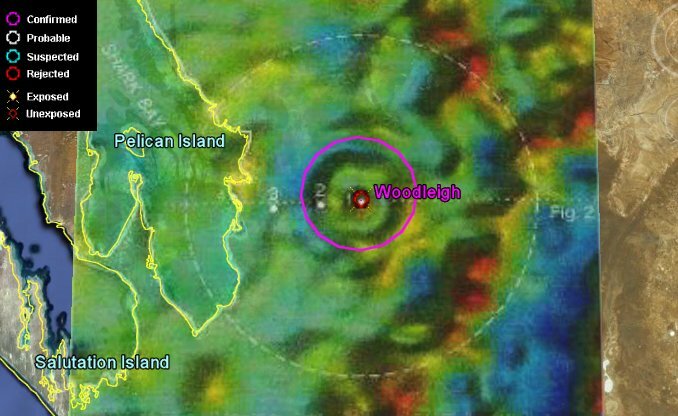 Woodleigh thus constitutes the largest member of a late Devonian impact cluster, which also includes Charlevoix (Quebec), Siljan (Sweden), Ternovka (Ukraine), Kaluga (Russia), Ilynets (Ukraine), and Elbow (Saskatchewan). Iridium anomalies related to the late Devonian (Frasnian-Fammenian boundary) events are known from the north Canning Basin, Western Australia, microtektites are found along this boundary in south China, and marked 13/12C excursions occur in Alberta. This extinction saw the elimination of rugose coral reefs, trilobites, ammonoids, brachiopods and conodont species, including destruction of the Devonian reefs which fringe the Kimberley Block, north Western Australia. A search is planned for tsunami deposits along the late Devonian boundary in the Gascoyne Province. Laser ablation ICP-MS and electron microscopy and microprobe studies of pseudotachylite and impact melt-injected shock-metamorphosed granitoid from the uplifted basement core of Woodleigh confirm earlier indications of anomalous siderophile and magnesian element abundances (Mg, Fe, Ni, Cr, Co, V) in the pseudotachylite and diaplectic glass inclusions within feldspar. 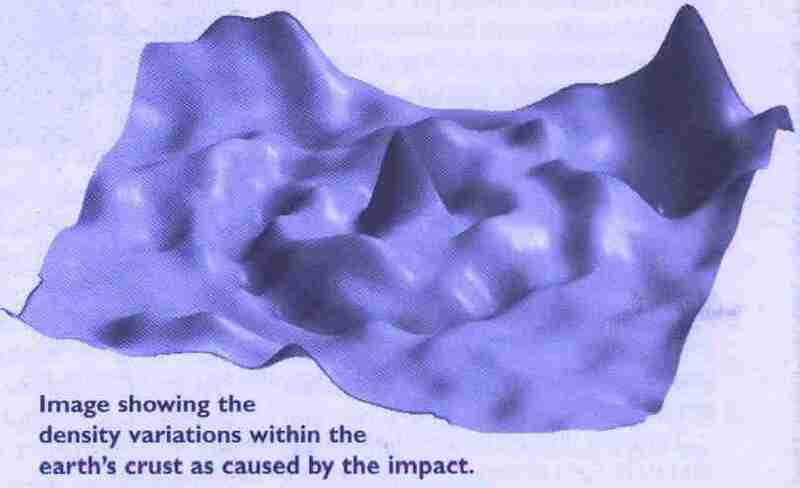 In the absence of ultramafic rocks in the vicinity, it is suggested the anomalous ultramafic chemistry is related to injection of melt and condensation of vapour phases derived from the exploding projectile. (Mory Arthur J., Iasky Robert P., Glikson Andrew Y., Pirajno Franco, 2000). (Glikson A.Y., Mory A.J., Iasky R.P., Pirajno F., Golding S.D., Uysal I.T., 2005). дБООЩЕ РП ИЙН. УПУФБЧХ ЗЙДТПФЕТНБМШОП ЙЪНЕОЕООЩИ ХДБТОП-НЕФБНПТЖЙЪПЧБООЩИ (P>20 зрБ) ЗОЕКУПЧ ЖХОДБНЕОФБ ХДБТОПК УФТХЛФХТЩ Wittenoom, ъБРБДОБС бЧУФТБМЙС. йДЕОФЙЖЙЛБГЙС РЕТЧЙЮОЩИ НЙОЕТБМПЧ ЗОЕКУПЧ УЙМШОП ЪБФТХДОЕОБ ЙИ ПВЫЙТОЩН ЪБНЕЭЕОЙЕН НПОФНПТЙММПОЙФПН, ЙММЙФПН Й УЕТЙГЙФПН. иЙН. УПУФБЧ ЧФПТЙЮОЩИ НЙОЕТБМПЧ ПФМЙЮЕО ПФ УПУФБЧБ ЧНЕЭБАЭЙИ ЙИ ЗОЕКУПЧ. пОЙ ПВПЗБЭЕОЩ ПФОПУЙФЕМШОП ФХЗПРМБЧЛЙНЙ ЬМЕНЕОФБНЙ Й ПВЕДОЕОЩ МЕФХЮЙНЙ. оБВМАДБЕНПЕ ПВПЗБЭЕОЙЕ ХДБТОП-ЙЪНЕОЕООЩИ ЗОЕКУПЧ Й РТПОЙЪЩЧБАЭЙИ ЙИ ЧФПТЙЮОЩИ ЗМЙОЙУФЩИ НЙОЕТБМПЧ ЖЕТТПНБЗОЕЪЙБМШОЩНЙ Ni, Co, Cr Й ЧЩУПЛЙЕ ПФОПЫЕОЙС Ni/Co Й Ni/Cr ПВХУМПЧМЕОЩ ЧОЕДТЕОЙЕН Ч ЗОЕКУЩ ВПЗБФЩИ УЙДЕТПЖЙМШОЩНЙ ЬМЕНЕОФБНЙ ЖМАЙДПЧ ХДБТОЙЛБ. (Glikson A.Y., Eggins S., Golding S.D., Haines P.w., Iasky R.P., Mernagh T.P., Mory A.J., Pirajno F., Uysal I.T., 2005).